You won’t often see an image of James Tissot’s mistress and muse, Kathleen Newton (1854–1882), in an art museum, as most are in the hands of private collectors. The divorced mother of two was in her twenties when the wealthy and popular French painter, eighteen years her senior, captured her beauty and elegance for posterity. 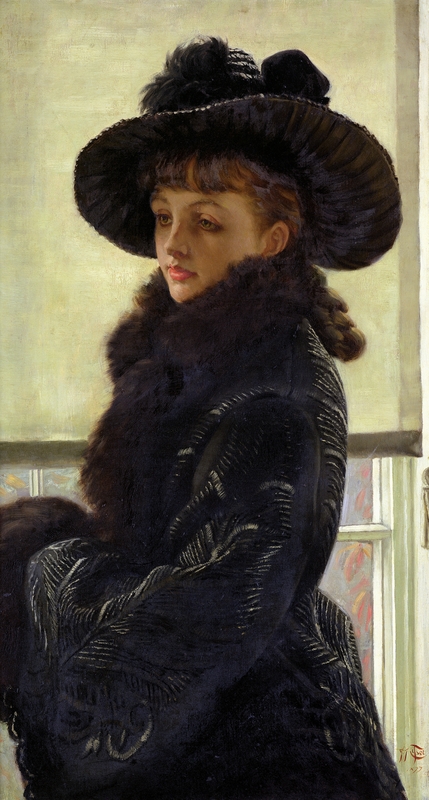 Tissot’s 1877 Mavourneen (Portrait of Kathleen Newton) had been in a private collection in Australia before it was purchased by Theodore Bruce, Adelaide at Christie’s in 1984. By the next year, it was with the Owen Edgar Gallery, London. In 1995, it was sold to an American collector at Christie’s, New York for $ 2,300,000/£ 1,433,915. The painting, in which Mrs. Newton wears the same ensemble as she does in October (1877), was last exhibited at the Delaware Art Museum in Wilmington from November 28, 2006, through March 30, 2007. Kathleen Mavourneen was a popular love song of the time (“mavourneen” means “my darling”), as well as a play by William Travers, which enjoyed a revival at the Globe Theatre in July 1876. 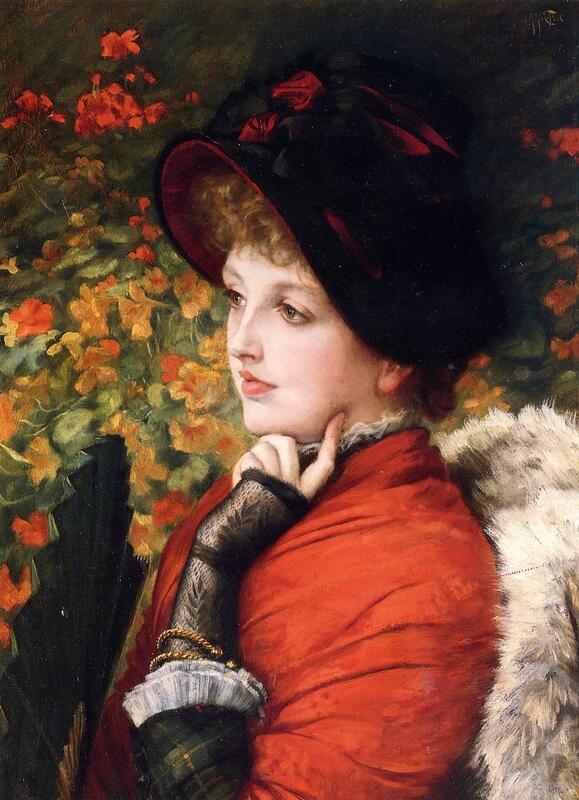 Tissot’s Spring (c. 1878) brought $ 1,572,556/£ 920,000 at Christie’s, London in 2003. It is now in the collection of Juan Antonio Pérez Simón (b. 1941), a Spanish telecommunications billionaire and naturalized Mexican citizen who has the largest private art collection in the world. He began collecting in his early 20s, and he now owns over 3,000 paintings representing artists from fourteenth-century Italy and the German Renaissance to El Greco, Rubens, Canaletto, Goya, Pissarro, Monet, Renoir, Van Gogh, Gauguin, Cézanne, and Dalí. Many of the paintings normally hang in Pérez Simón’s six homes, but he plans to leave them to a museum to be built in Mexico City. 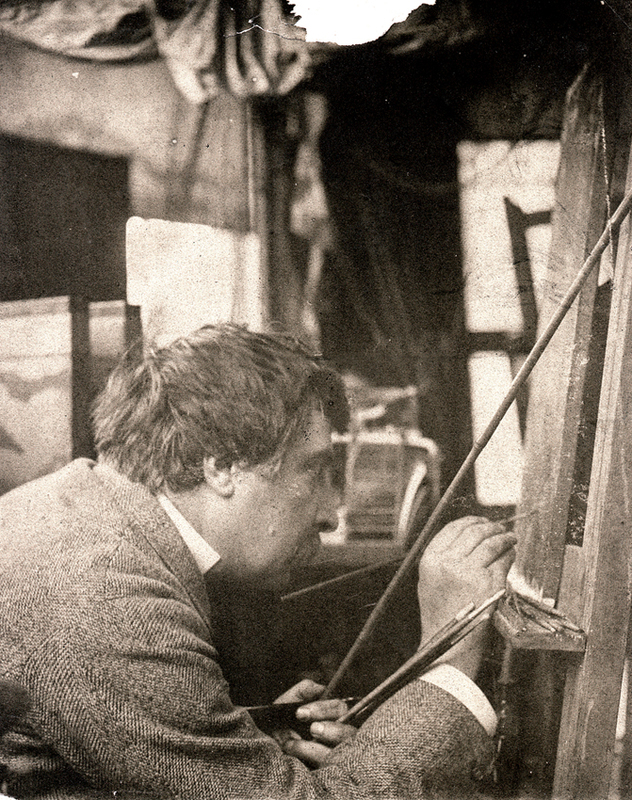 His collection is also the largest private collection of Victorian art outside Great Britain. The Paris-based art dealership Goupil & Cie purchased L’Ete (Summer) from Tissot in 1878, the year it was painted, for £220 (5,500 francs). By 1884, it was in the possession of Philadelphia art dealer and critic Charles Field Haseltine. By 1908-09, it was owned by John Francis Brice, Paris. It passed to his son-in-law, Fitch Monroe Briggs, and then to his son, John Kirkpatrick Briggs, Massachusetts. It was sold by the Estate of John Kirkpatrick Briggs at Sotheby’s, New York in 2002, and in 2007, it was sold again – for $ 1,484,700/£ 750,000 at Christie’s, London. In 1878, Tissot painted a small oil replica of October (1877), in the collection of the Musée des Beaux-Arts de Montréal since 1927. The original is 85 by 42.8 in./216 by 108.7 cm, while the replica measures 45.5 by 20.5 in./115.57 by 52.07 cm. As of 1985, the replica’s whereabouts were unknown. But in early 1995, the replica was sold at Sotheby’s, New York for $ 2,800,000 USD/.£ 1,775,185 GBP. The exquisite A Winter’s Walk (Promenade dans la neige) (c. 1878) has belonged to a number of private collectors over the decades: J.C. Haslam Esq., 32 Queen Anne Street, Cavendish Square, London, whose executors sold it at Christie’s in 1900 to London-based art dealer Arthur Tooth. By 1937, it was owned by Mrs. Bannister, and by 1956 by Henry (Harry) Talbot de Vere Clifton, Lytham Hall, Lancashire. Christie’s sold it once again in 1965, to Leger Galleries, London. It was in a private collection when it was sold by Sotheby’s, London in 1996, to another collector, for $619,160/£ 400,000. 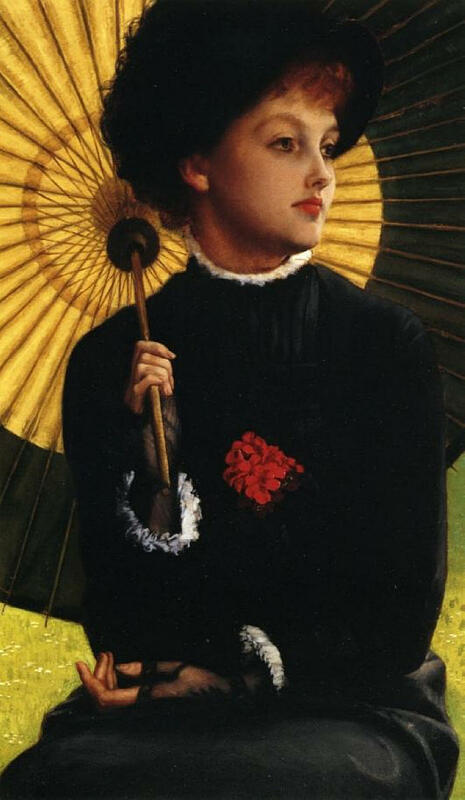 A popular Tissot image of Kathleen Newton, A Type of Beauty (1880), sold at Sotheby’s, New York 1989 for $ 675,000/£ 385,560. In 1991, it sold at Christie’s, London for $ 273,760/ £160,000. But in 1882, at Christie’s, London, no buyer could be found for it at £ 67 4s! Quiet (c. 1881) was bought by Richard Donkin, M.P. (1836 – 1919), an English shipowner who was elected Member of Parliament for the newly created constituency of Tynemouth in the 1885 general election. 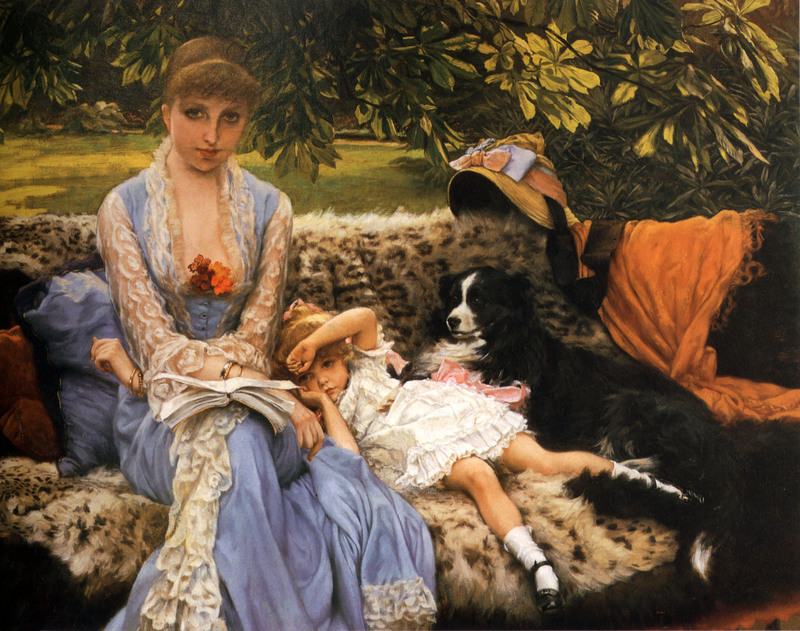 The small painting remained in the family and was a major discovery of a Tissot work when it appeared on the market in 1993, selling for $ 416,220/£ 280,000. In perfect condition, it shows Kathleen Newton and her niece, Lilian Hervey in the garden of Tissot’s house at 17 Grove End Road, St. John’s Wood, in north London. It was Lilian Hervey who, in 1946, publicly identified “La Mystérieuse” – the Mystery Woman – as her aunt, Kathleen Newton. 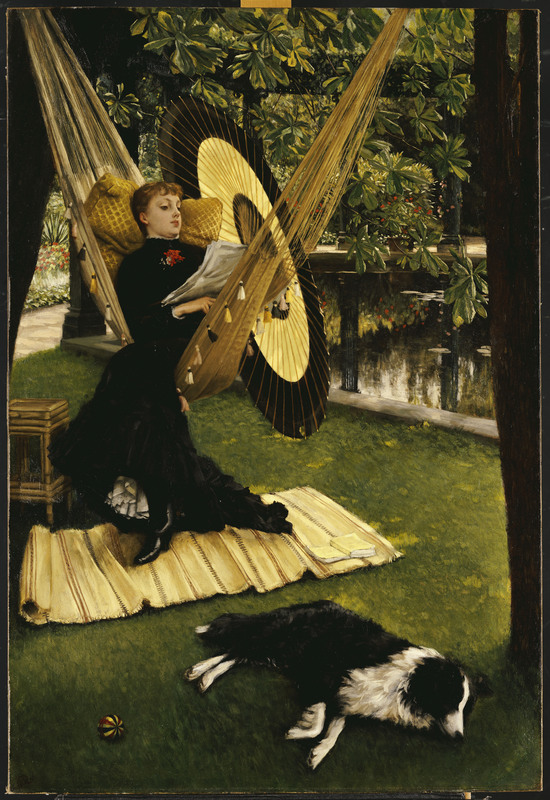 And, of course, The Hammock (1879), was sold by Christie’s, London in 2001 for $ 1,708,800/ £1,200,000. It had not been seen in public since it was first exhibited at the Grosvenor Gallery the year it was painted. 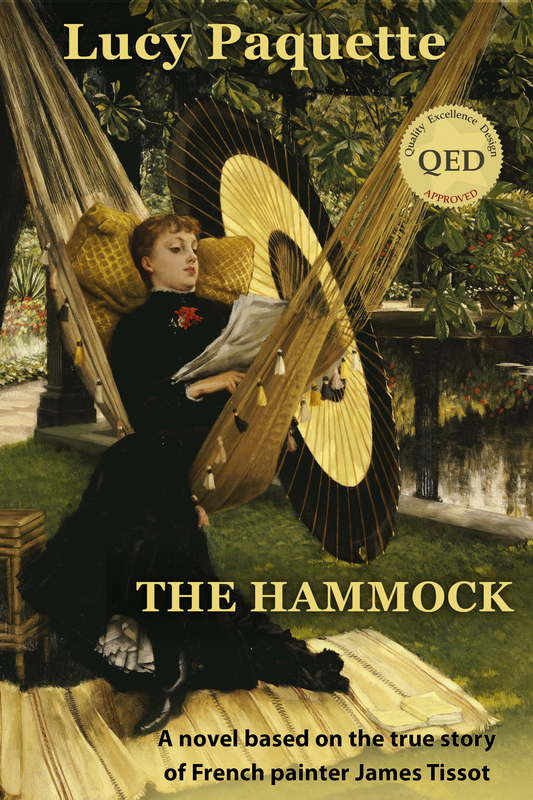 This entry was posted in Art blog, Art History, Impressionists and tagged James Tissot, Kathleen Newton, Victorian paintings on May 28, 2013 by Lucy Paquette, author of The Hammock: A novel based on the true story of French painter James Tissot.